A little on Wilson Creek to begin: This is a land where steep, winding dirt and gravel roads are the norm. The entire area is kind of nestled in between the Linville Gorge to the west, Grandfather Mountain & Blowing Rock to the north, and Lake James to the south. Linville Falls is one of many attractions that is very close by. Wilson Creek is a designated wild and scenic river, and runs from its headwaters on Grandfather Mountain’s Calloway Peak to its eventual confluence with the Johns River some 23 miles or so downstream. This stream is very popular with fishermen, kayakers , sunbathers, and swimmers as this river seems to have a little something for just about everyone. While Wilson Creek itself does not have any waterfalls, except for some named rapids, it’s tributary streams have much to offer. 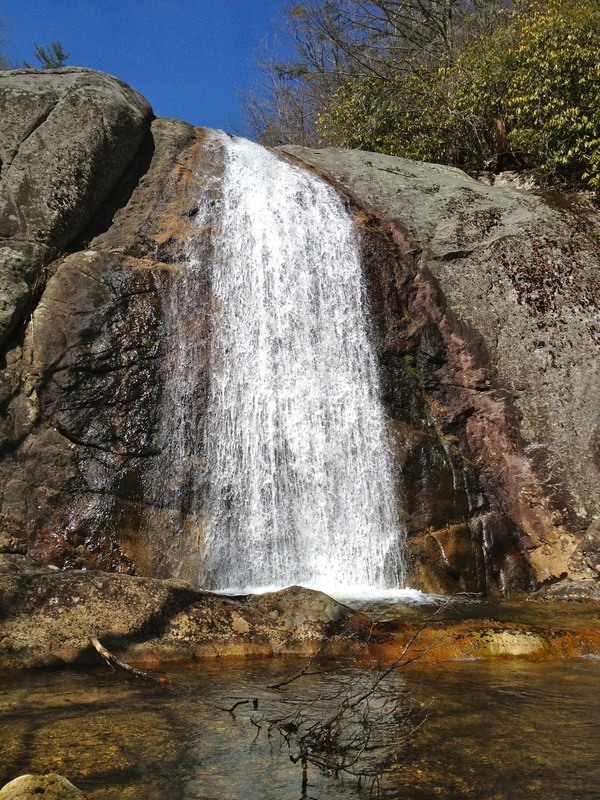 There are at least 10 named waterfalls in this region, on a number of streams such as Harper Creek, North Harper Creek, Upper Creek, Raider Camp Creek, Lost Cove Creek, and Gragg Prong. There are hiking trails running just about every which way through here. The Mountains To Sea Trail, also runs right through the Wilson Creek area, making a number of turns on different trails as it works it’s way through. Before hiking here, I would certainly recommend purchasing the waterproof map. The waterfalls would be difficult to find without one. The trails are not marked well for the most part and it would be easy to get lost if one is not prepared with a map and/or GPS. There is so much to do here. Overall, it is simply a fascinating place! The waterfalls chosen today lie on Harper Creek and North Harper creek. Harper Creek is probably the largest tributary to Wilson Creek in this area. North Harper Creek runs into Harper Creek and is a good size stream as well. My hike today was simply two out and back hikes to the waterfalls, with a good 10 mile dirt road drive in between the two. 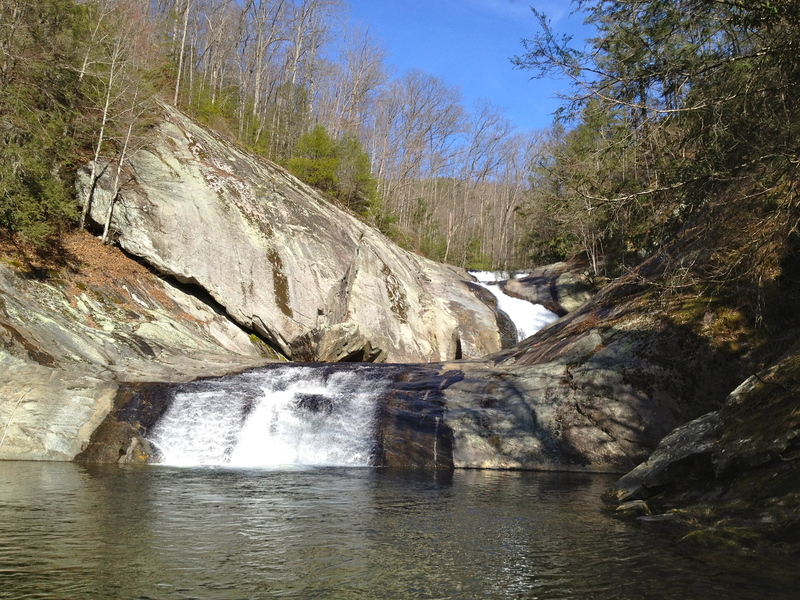 The trip began on Trail 239-North Harper Creek Falls. 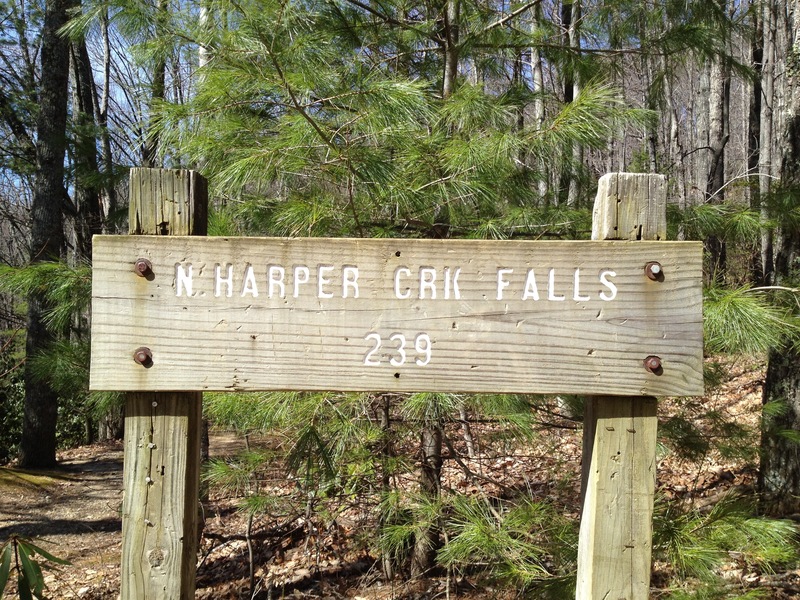 North Harper Creek Falls has 2 main ways to access it, Trails 266 and 239. Trail 266 is a shorter option, beginning at a trailhead off of Forest Road 58. While shorter, it is much steeper, with some creek wades required, and large trees blocking the trail the last time I was there. Trail 239, while a tad longer, is much more of a level hike with only a few ups and downs. However when 239 and 266 meet, it does get steep for a short distance. They meet and go down the hill to North Harper Creek, coming out at the top of Chestnut Cove Branch Falls. This was a nice area although the waterfall was not very impressive. It was more of a slide down bedrock than a waterfall. It also tends to flow on the side that is partially covered by bushes growing on the opposite side. There are a few deep holes in the bedrock at this waterfall, the one above was filled with what had to be hundreds of tadpoles. 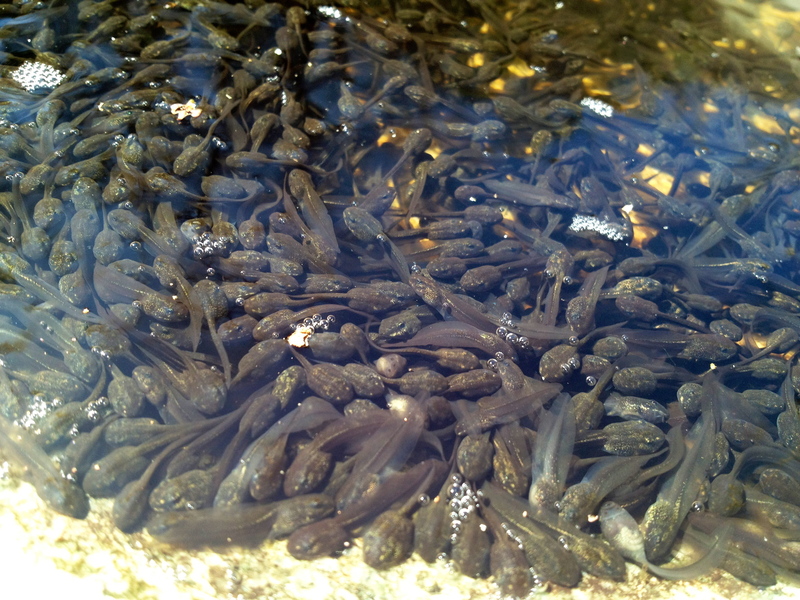 I am guessing it is going to be a froggy season on North Harper Creek!! Just upstream and after a somewhat tricky creek crossing, is North Harper Creek Falls. My first reaction was ….WOW! It is not the biggest waterfall in the state, and it does not have the most waterflow, but the contrast of the white water, to the colorful rock and the deep blue sky just make this something to sit back and take in its beauty. 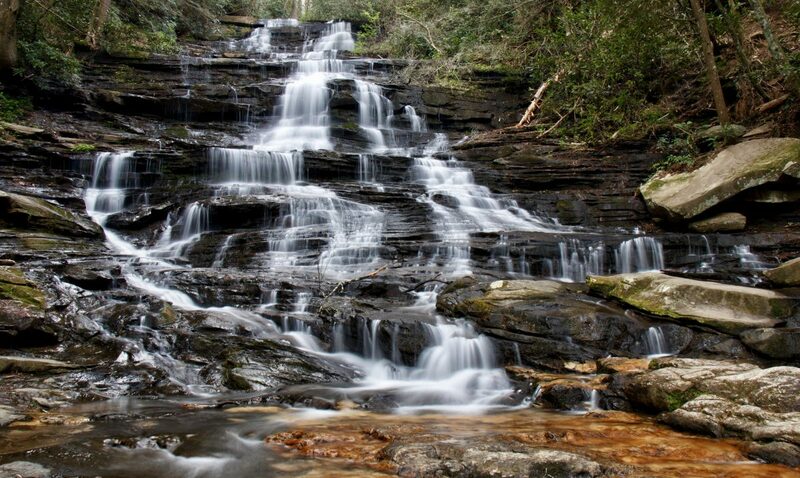 It may be one of the most picturesque waterfalls in the state. I really liked this area. After a short break, and a visit to the very nice Wilson Creek visitor center, I decided to complement my first hike with one to Harper Creek Falls. 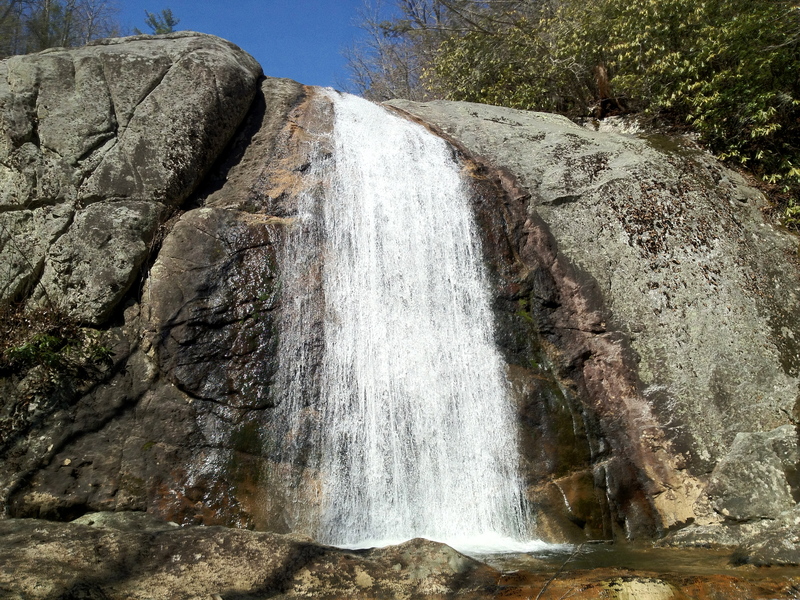 This one may be the most popular waterfall in Wilson Creek. This is done so on Trail 260-Harper Creek , which begins on Brown Mountain Beach Road, about 2 miles from the visitor center. This trail begins with a bang, going straight up, resulting in instant huffing and puffing. Once at the ridgetop, the next mile and a half is fairly level, with a few tight spots to navigate. It is when you get to Harper Creek Falls, that things get interesting. Harper Creek Falls is a 3 tiered falls that requires a wicked rock hop from a side path, or you can go right to the falls and use the supplied rope to shimmy your way down the steep rock. I have tried both ways, and the rope is the quicker way to go. Use extreme caution either way!! Once down at stream level, this waterfall is beautiful. The pool below the falls is very big and deep. This area is full of people in the summer, so finding it today like this was a real treat for me. 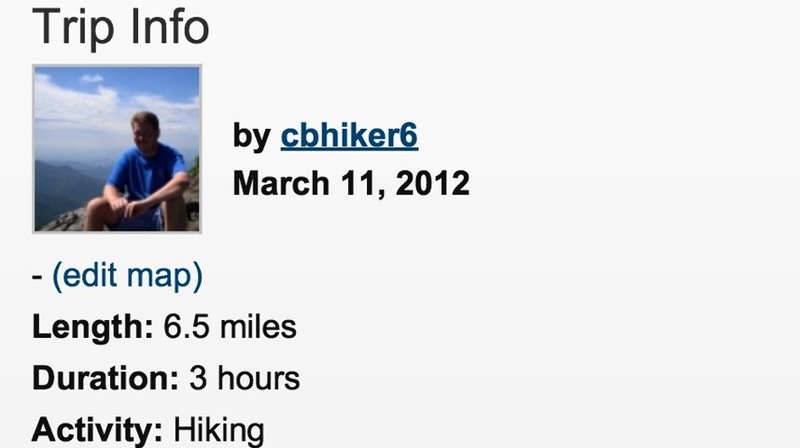 After heading back, I ended up with a hike close to 6 1/2 miles and 2 gorgeous waterfalls on a beautiful day. So Hapers falls is one of your favs I can see why. Those tad poles were numerous. Yummy for frogs. It certainly is Penny! North Harper Creek Falls that is. If you look at the falls, there is a huge rock that juts out almost to the middle of the creek. It is easy to walk out there, sit down, take your shoes off and put your feet in the water. This is a place i anticipate using my new water shoes!! 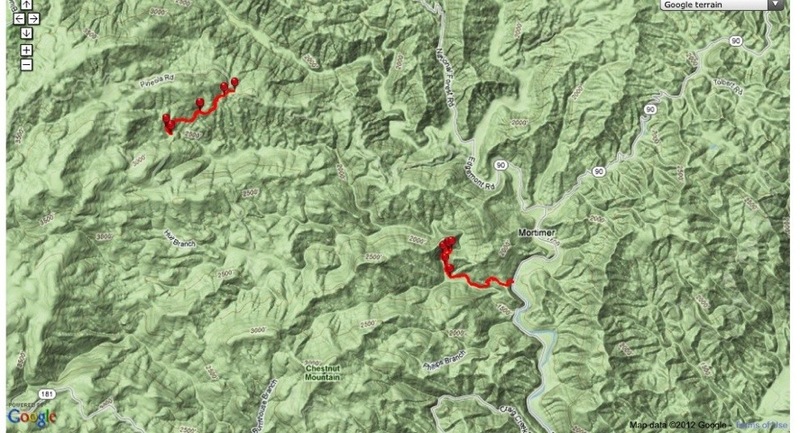 It must be remembered Harper Creek and North Harper Creek trails are infested with illegal bicycle riders on occasion and when encountered please tell them to get off the trails! I nearly got ran over by a group of them on a hike to Bard Falls one summer. I know exactly what you mean.